Horizons was, perhaps, the pavilion that brought together all the ideas of tomorrow from throughout Future World and placed them in one succinct story. Transportation, agriculture, energy, imagination, communication, and even exploration were all themes that played throughout Horizons. 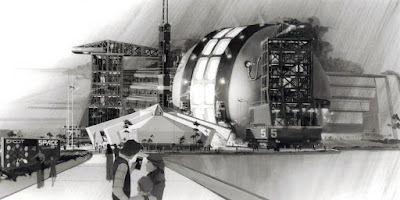 During EPCOT Center’s planning and development, however, Horizons wasn’t on the drawing board and in its place stood a behemoth of an attraction known as the Space Pavilion. Don’t believe me about the size? Then take a closer look at the size of the guests entering the structure at the base of the pavilion. To my eye, the height of that entryway looks close to that of Horizons, leaving the spacecraft to reach for the stars, both figuratively and literally. In this rendition, EPCOT Center would have had wayfinding signage that didn’t list pavilions, but mapped out the entire park and identified what pavilion you were currently visiting. If you look closely, the original location of the pavilion would have been where The Living Seas would eventually reside. The real story here isn’t the size of the Space Pavilion or where it lived, but what it sought to teach guests. The pavilion wasn’t a spaceship or rocket, it was known as the Space Vehicle. It was designed by Ray Bradbury and John De Cuir, Senior, and would have launched guests from the early days when man looked up to the stars and dreamed, all the way to the edge of the universe. The vehicle itself would have housed the massive theater that would utilize visual and in-theater effects to simulate space travel. Beyond these scant few facts, not much else is known about this pavilion that never came to be. While it was included in the 1977 Master Plan 5 for EPCOT Center, it would continually get pushed back, beyond the opening of Horizons, The Living Seas, and Wonders of Life, before eventually being shelved altogether. It isn’t hard to see how the Space Pavilion informed sections of Horizons’ story and further on down the road the development of Soarin’, but that trip to the stars sure would have been an adventure of a lifetime. The other pictures of the pavilion makes it even more confusing. It looks like those "windows" on the outside of the sphere are a bunch of massive screens, and there are giant sets of theater seating on either hemisphere, sort of like Soarin', except that you look across at another bank of seats instead of a screen, and you'd look to the sides for the images. Also, I've learned not to take scale too literally in concept art. Take the subs in the Living Seas' concept art for example. I assumed the theater seats would move, but this makes it look like the sphere itself rotated. That would have made the turntable in Journey Into Imagination seem like a minor set piece. Also, Bradbury reportedly wanted at least a brief weightless part of the ride, which is just baffling for a ride this size. Even the "weightless" part of Mission Space takes a lot of energy for a few people at a time. Overall, I think this is one of those things that looks great as concept art, but the execution would not have lived up to this art.